It is a topic of debate what is actually the King in Blogging? Some say content is the king while other means promotion and there are a significant amount of people who say SEO is the KING. Definitely, we are not going into the debate, but if all three can be mixed, the online business will have a huge success. There are tons of online business/website but are all successful or do all are visible? A big NO. We only check those sites which are visible in the search engine and that directly proportional to SEO. SEO is the best & almost free method to technique to get maximum exposure. But due to very high competition these days in all the niche, you can’t easily rank. But here comes the need for tools like SheerSEO. It helps you to analyze your site from search engine perspective and helps you to perform well. 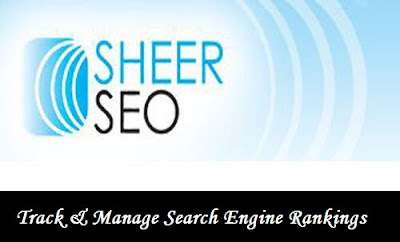 SheerSEO is an SEO software which provides online services since 2006 and helps you to analyze SEO of your site. The service allows you to automate the process of SEO analysis. With over 56k+ users worldwide, SheerSEO software automates your SEO efforts, including rank tracking and link building. The best thing that I liked about them is, SheerSEO works inside a web browser and allows you to use all of the functionality without downloading any application. I also wanted to note that almost all features that deal with reporting contain various ways to show graphs and history of your data. You can also export all of this data into PDF data straight from their interface. There are multiple features of SheerSEO and works as an SEO management tool to analyze and work on your search engine ranking. Despite having lots of features, SheerSEO has maintained the interface very simple and so anybody can use it in the first instance itself. SheerSEO also shares the social media shares’ counts. You will get Twitter & Facebook shares counts. 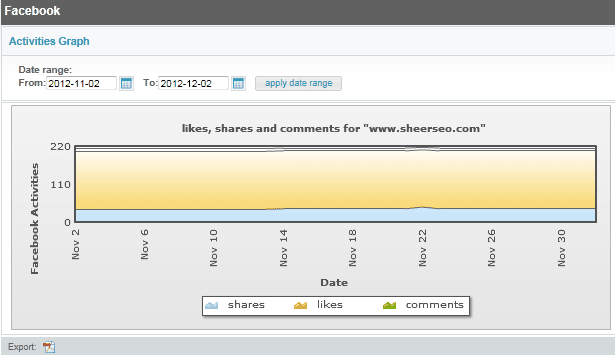 You can also generate graphs based on the number of tweets/shares done for your site between a particular date range. 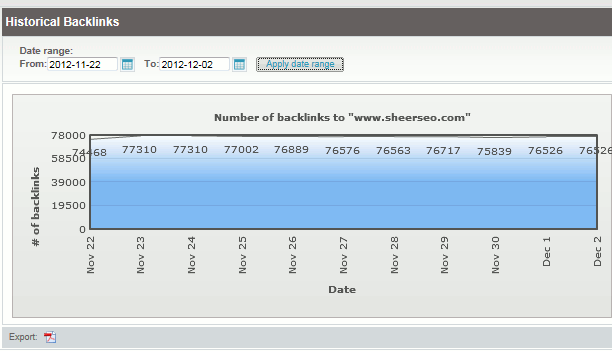 SheerSEO shows you the number that each of the keywords appeared on your pages. This tool monitors the number of times a particular phrase has been used in the page/post and share the details with you. It also reports the number of indexed pages in Google for your site. You can keep track on daily basis of this data and can see the progress. Sheer SEO tells you about the number of backlinks a site is having. So you can keep a tack of your link & of your competitor as well. You can also add some links as a guarded link here and keep those for close watch. They also provide 2 months of free services. The prices are very less compared to what the big fishes of industry take. 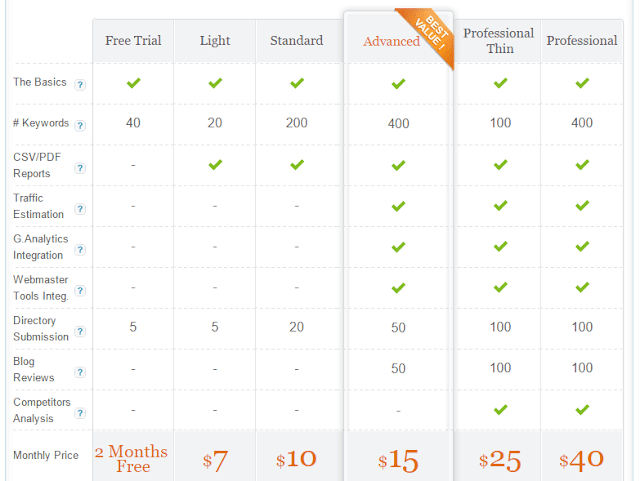 Recently I have published few SEO management software's’ review under a WebMeUp alternative, and you can compare the price. Also, the best thing is, they do these campaigns manually which involve directory submission, blog reviews, etc. and so is safe as well. Which SEO tool you are using for SEO?